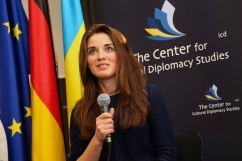 News from Berlin - On March 26th the ICD Berlin was honored to have Yulia Marushevska, a Ukrainian student and activist who became famous due to her video ‘I’m a Ukrainian’ which went viral during the first weeks of the revolution. Ms. Marushevska took the opportunity to speak in front of the Brandenburger Tor, the Berlin symbol of freedom and national Unity to create awareness that trembling uncertainty in Ukraine is not over yet. Ms. Marushevska tried to make the public understand that her cause to make a video about her story and broadcast it to the world was not a very political one. In fact she wanted to tell her story that up until now, the story was covered inappropriately as far as she is concerned. At the time the video was made, in early February 2014, the situation was not well covered by the international media. This is when the student of Kiev decided to make a video, in which she would tell her story and ask for support from the international community. She emphasized again that Ukraine was ruled by a dictator and corruption was poisoning all stages of live, so that young educated people who were listening to her speech should imagine living in such an environment. iated all Russians and that the Putin-Government would be the aggressor in this case, not the Russian people. “I hope”, she said, “that one day the Russian people will win its fight against corruption and for freedom”. 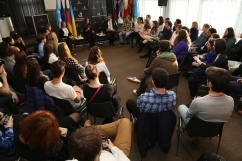 At the same day students and the public also had the possibility to ask Yulia Marushevska questions in a panel discussion at the Institute for Cultural Diplomacy. There, she also explained the challenges in her own country that occurred when her video became famous. Different sources of media reacted in a hostile way and considered her approach as propaganda. This had also negative effects on her personal life and Ms. Marushevska described to the students that the costs were high, but still that the outreach of the message was worth it. Yulia Marushevska has become an unofficial ambassador of the values she fought for and is lecturing about her experience and the situation in Ukraine around the world at the moment.